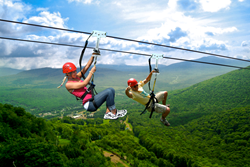 Soaring through the Catskill Mountains at NY Zipline Adventures at Hunter Mountain. ...it’s great to be in the top percentage of ziplines in the world, not just the country! We think we have something special here in the Catskills, it’s always nice when other people think so too! Fodor’s Travel, a world leader in the expert travel advice industry, has announced their list of the World’s Most Amazing Zip Lines. For almost 80 years Fodor’s has presented travelers with the very top recommendations from hidden-away restaurants to can't-miss museums, to make sure they’re making the most of their travels. For years, New York Zipline Adventures has been an industry leader in both safety and guest satisfaction. They’re located in the heart of the Catskills, at Hunter Mountain, a family favorite destination since the late 1950’s. NY Zipline Adventures operates year round with their Mid-Mountain Zipline Tour, their Adventure Tower and their Skyrider Zipline, one of the longest, fastest and highest zipline tours in North America. With three options to choose from, they’re the ultimate adventure destination, just two hours outside of New York City. The Fodor’s name has been synonymous with travel for more than 75 years. Their award-winning guidebooks, website, eBooks, and mobile apps provide today’s traveler with up-to-the-minute information to over 7,500 worldwide destinations. To see the full list of the World’s Most Amazing Zip Lines, visit the Fodor’s website. Learn more about New York Zipline Adventures at http://www.ziplinenewyork.com.